The Philadelphia Eagles headed down to Dallas to play the Cowboys, in a greatSunday Night Football throw down. This week 14 match up was a crucial game for the Eagles as they were able to keep their lead at the top of the NFC East at (9-4). The Cowboys, slipped to (4-9) and are at the bottom of the NFC East. This game is going to have a huge impact on how the Eagles proceed into the postseason, and whether or not they will be able to win out the NFC East. Currently holding a one game lead over the Giants, who have still not played this week. 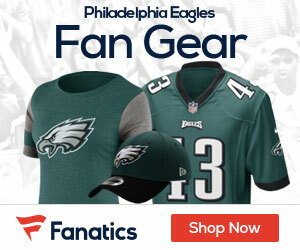 Depending on how the Giants perform on Monday, this could be the win that gets the Eagles into the playoffs. The Cowboys continue to fall, and although they are just playing for honor and just trying to keep their division rivals out of the playoffs, this loss didn’t effect them at all. In fact, if anything it may have just helped them even more. With this loss, it gives the Cowboys an even better draft pick, and it does not effect the remainder of their season. There may not be a better backup QB in the entire NFL. Jon Kitna is the man. When I watched Tony Romo hit the dirt and sustain a season ending injury, I thought the Cowboys and any hope of generating offense were long gone. Ktina stepped in and had a tough time when Wade Philips was still the coach. The Cowboys name Jason Garrett the head coach, and Kitna plays like an NFL starter. Kitna has impressed me beyond all belief, and I think he is doing an excellent job filling in for Romo this season. I watched in this game as Kitna was able to find the open receivers down field, convert third downs, and even take off and scramble for some nice yardage. I’m thinking that people may really be underestimating Kitna, and he proved that he can be a starting QB in the NFL. If I were a Cowboys fan, I would be proud of how KItna performed in this game. He made all the right moves when the Cowboys needed it, and this loss should not be pinned on him. Michael Vick threw two interceptions in the game. That’s right, Michael Vick had two turnovers. But, aside from those two mistakes, he performed like everyone expected him to. Vick was able to expose the Cowboys’ secondary whenever he had time to throw. Constantly finding a wide open DeSean Jackson and connecting for a deep pass on the first play of the game, and then late in the game scoring on a huge throw to Jackson. However, other than Jackson, Vick had trouble finding anyone else to throw to. Jackson finished the game with a total of 210 yards, and the second highest receiver was Jason Avant with only 18 yards. 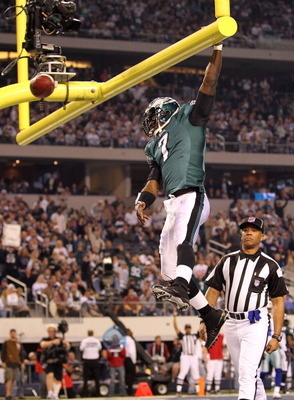 Obviously, Vick was having some trouble spreading the ball around. Either that or the Cowboys just had an incredibly effective pass defense. It seemed like the only issue with the passing game was Vick’s blocking. The offensive line was either really solid, or just non-exsistnet depending on the play. They allowed Vick to take several big shots on sacks, or just as he was throwing the ball. Fantasy owners for Jackson are most likely still comatose from the explosive numbers he was able to post for the first time all season. Someone tell me- When does LeSean McCoy not play to win games? This is now McCoy’s third 100 yard rushing game of the season, and that’s in Andy Reid’s offense. This kid is something special and every time he takes the handoff he is able to make something happen. McCoy can just do it all, and he is the type of guy that you want rushing for you late in the game. This is the third game of the season where McCoy’s late game rushes for 20+ yards have been able to close out the game. Even against a tough Dallas rush defense, McCoy was able to juke his way around and finish the game with 149 yards. McCoy is great in the open field, and when it comes down to just one last guy, he is gone. His speed is unmatched on the field, and it shows when he takes the handoff and just explodes out of the back field. He is not afraid to lower his head and power through defenders. I have nothing but praise for McCoy. Can you tell? The Eagles offensive line may have failed in pass protection, but they did an excellent job giving McCoy big holes and great blocks. It would be unfair to not give them any credit, as on several rushes they made it happen. Good performance by the offensive line in this respect. Didn’t the Eagles trade for a guy named Jerome Harrison? You would never know. Felix Jones was brutal on the Eagles linebackers and defensive line today. I don’t know if it was just good blocking or just poor tackling, but Jones was able to make it work. There were several plays during the game where I expected a loss in the backfield, and it ended in a first down for Dallas. Early in the game the Eagles lost Stewart Bradley, to an absolutely painful elbow injury and Dallas was able to exploit that. Jones knew that without Bradley the Eagles had lost quite a bit of speed in the middle of the field, and on several runs he ran cutbacks over the middle to pick up big gains. Jones was held to a total of 41 yards and one touchdown in the game, which is not to bad. The alarming part about the rushing game, was the missed tackles. It seemed like on every handoff it would take four Eagles to get one Cowboy down. Jones is not a power running back, and he may be elusive, but that is no excuse. The Eagles need to improve their tackling on running backs or the next time the Eagles meet the Cowboys, Jones is going to have a break out game. Did anyone else see that 4th down rush by Kitna? The crazy part is- Kitna has 11 more rushing yards than Vick did. The Eagles still can’t cover tight ends. That did not change in this game. I don’t know why Kitna didn’t just try his luck with Witten on every single passing play, because it seemed like he was open on every passing play. I know that is a bit of an exaggeration, but this was a serious problem. Witten may be one of the best receiving tight ends in the NFL, but when your defense allows him to score twice in one game, and finish with 69 yards, there is a problem. It didn’t matter where the Cowboys lined Witten up, he was able to make big catches and burn Eagles defenders. Also, the Eagles allowed the slot receiver, in this case it was Kevin Ogletree, to just sit over the middle of the field and make first down catches. I would think that Sean McDermott would have made this a priority to cover the middle, but there was just no one there. The Eagles defense was able to get two interceptions during the game. One coming off of a tipped pass, and the other was just a great jumped route by Dimitri Patterson. This is something the Eagles were struggling with in Asante Samuels absence, and it is great to see some takeaways. In reality, the Eagles secondary did just barley enough to win the game. It is an improvement from last week, but by a small margin. Jorrick Calvin did good on kick returns, he also had a funny rookie mistake in the endzonn when he was trying to run the clock out. DeSean Jakson didn’t really get a chance to return any punts. Coverage was fine on both punts and kicks. Bobby April just did a good job preparing for this game. Andy Reid did a good job of not allowing four straight losses to the Cowboys, and was able to pick up the tough win on the road. The play calling was conservative as ever, but it was enough to get the job done against a nothing to lose Cowboys team. Marty Mornhinweg did an excellent job of getting Jackson open on deep routes, and allowing Vick the time to get him the ball. The play action was run flawlessly throughout the game, and that is generally what led to the big passes. Mornhinweg was finally able to get the ball to McCoy, once the the second half started. Not a bad offensive performance. Sean McDermott was able to get some pressure on Kitna, but in return he gave up the touchdowns to Witten. It was a tradeoff, and there was quite a few aggressive blitzes that usually resulted in positive plays for the Eagles. Once again, it was enough to win the game. Not to bad of a coaching performance, but I expected a little more out of them. The Eagles did just enough to win this game. It was much closer than I would have liked to see, but a win is a win. This is something the Eagles needed to do. Not only snapping a three game losing streak against the Cowboys, but also staying on top of the NFC East. 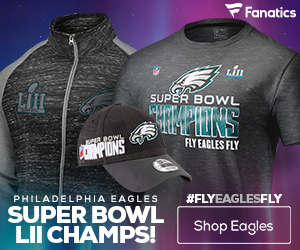 This game showed how serious this Eagles team is, and now that they have downed another division opponent it gives them a significant boost heading into the final weeks of the season. Not only is this a momentum win, but is is Vick’s first career win against the Cowboys. Something every Eagles fan wants to see. The Eagles extend their winning streak to two straight games and are looking more and more like a playoff caliber team. It is going to be an excellent end of the season for the Eagles, and some awesome games are coming up. The next game the Eagles play is against the New York Giants at the Meadow Lands. Which is the second and final game of the series this season. This is going to be a tough game, and this is going to be a decider in who goes to the playoffs. Depending on how the Giants game shakes out, it could be the game of the season. Eventually ending in who wins out the NFC East. It’s always sweet to get a win against Dallas, even more so when it is a win in Big D.